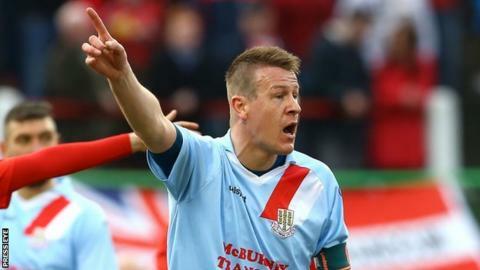 Ballymena United made it six league wins in a row by beating Dungannon Swifts at the Showgrounds. Allan Jenkins headed home from David Cushley's inswinging corner in the 18th minute for his 12th goal of the season. Andy Coleman's clearance then hit Darren Boyce but flew narrowly over, while Andy Coleman denied Cushley. Gary Liggett dragged a shot just wide and Jamie Glackin tested Dwayne Nelson from the edge of the area as Ballymena ended seventh and Dungannon 10th. United defender Davy Munster was named captain for the day in his final game before his retirement.